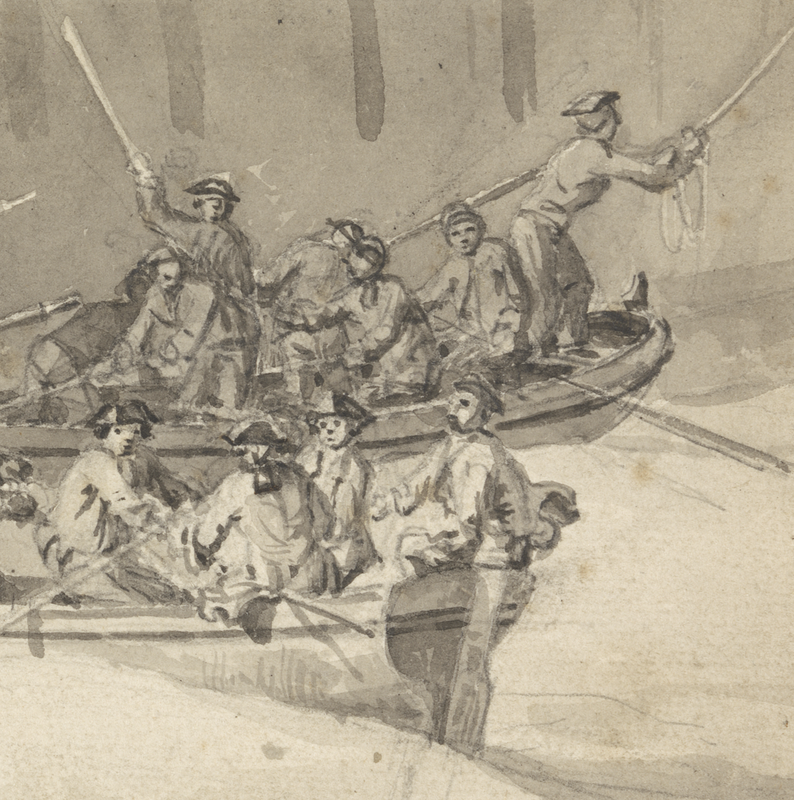 "Two Boats with Crews, Study for The Royal William at Sea," Samuel Scott, c.1765, Yale Center for British Art. Samuel Scott, the renowned marine artist, painted the Royal William around 1765. This was later deemed by one art historian as one of "the finest marines by Scott in existence." The original was sold at auction in 2007 for £34,100 ($70,665). The Yale Center for British art has one of the studies made by Samuel Scott for his masterpiece. Originally attributed to the French-English artist Dominic Serres, some past archivist or curator went so far as to write Serres' name on the back of the original. This was then scratched out by a subsequent scholar. Both have left their marks on a two century old artifact for future students of British art to shake their heads at. Scott's study features two boats alongside each other, but bearing in opposite directions. We'll start at the bow of the boat in the foreground, her bow pointed to the left. All of the tarpawlins wear single breasted jackets, but sitting as they are it is difficult to say whether they wear breeches, petticoat trousers, or trousers. Certainly bar caps are the most common among them. The furthest oarsman forward (sitting aft of the man with the boathook) may be wearing a knit cap: it sits further up his head with a taller and less symmetrical crown. The sailors on the boat to their starboard stand and work amongst the officers and passengers in their stern. These tars wear cocked hats: one with the point forward, one with the point back. Of the two standing sailors in the boat to the background, one bends toward the stern, allowing us to see that he wears either trousers or petticoat trousers. At the stern of the boat int he foreground we see one oarsman in a cocked hat with the point forward over his right eye. The cox, abaft the two officers, also wears a cocked hat, but of an extremely small nature, even smaller than most sailors' hats. Either that, or it is a barge cap of highly unusual cut. What do you think? The details on the crew of the boat to the background get a bit sketchy. 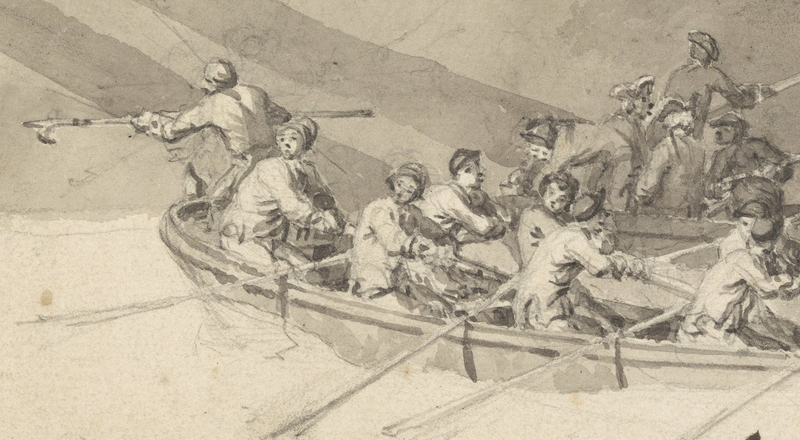 It is a scene of controlled chaos, with oarsmen keeping the boat in place while the man in the bow grips a line. That tar in the bow wears a short jacket that ends at the waist, baggy trousers, and another odd hat: perhaps the tiny cocked hat we see on the cox in the foreground. His mates wear a mishmash of cocked hats and barge caps of the jockey style.